Deidre's Discoveries: Mission: Gotta Use These Up! After going through all of my makeup these past few weeks, I condensed almost all of my single shadows into a Z-Palette and discarded old makeup that I didn't like, or didn't want to try because it was just so old. I put some items aside, just to use them up. Some have hit pan, some haven't, but I want to use them up instead of throwing them away! Here is my next mission - gotta use these all up! 1. Chapstick Hydration Lock - I got this in a Beauty Box 5, and I like it. I just have a million chapsticks opened, and it has been within reach. I've been getting good use out of this. 2. Oxy Emergency Acne Vanishing Spot Gel - I haven't been using much of this since I got the Mario Badescu Drying Lotion. But it's almost empty, so I will be using this whenever I get my next break out(s). 3. Josie Maran 100% Pure Argan Oil - I've had this for probably 2 years, I'm not sure what the expiry is on it. But I've been mixing it with my night cream to get even more moisture on this dry face of mine. Not much is left in this anymore. 4. 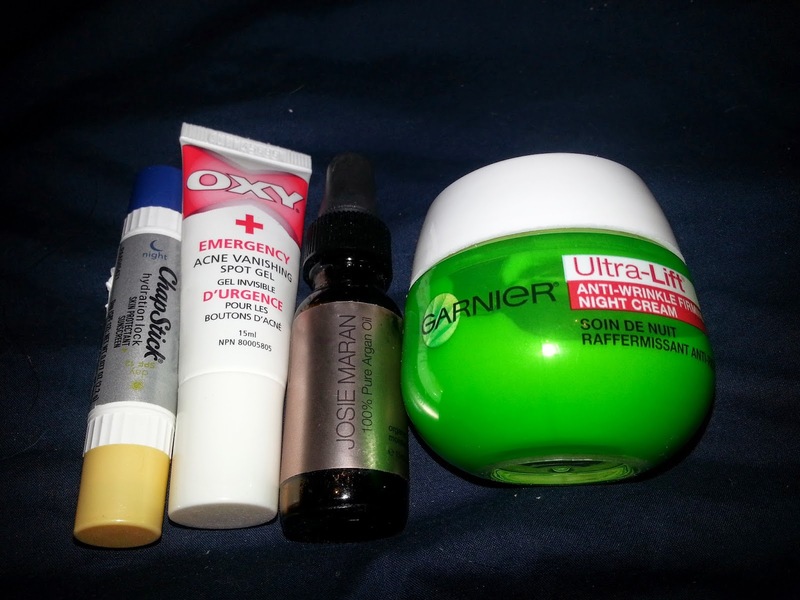 Garnier Ultra Lift Anti-Wrinkle Night Cream - if you read my review on this, you would know how much I hate it. But I've been using it on my elbows, hands, and feet to finish it off. Theres about half a jar left, and I'd like to use it up instead of throwing it away. 1. ELF Essential Lip Stain in the colour pink petal. I hadn't tried a lip stain before getting this, but I just wasn't impressed. The colour isn't too noticeable on my lips, and it doesn't last long either. I'm going to try and use this up before it dries up. 2. Benefit Cosmetics - Bad Gal Lash - I got this last year in my Shoppers Drug Mart Mascara Sampler. I'm not a huge fan of it, but it isn't the worst. 3. Revlon Growlucious Mascara - I actually really like this for a basic mascara. 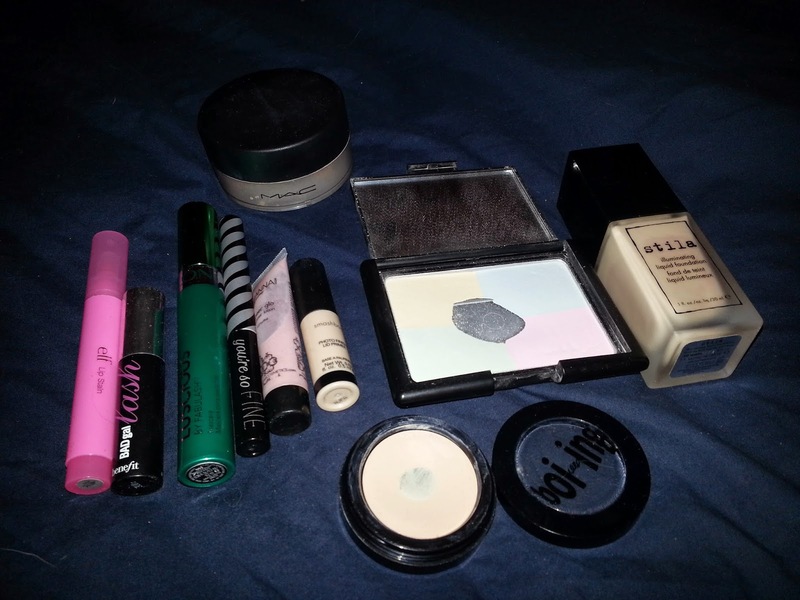 There is nothing amazing about it, but before it dries out, I'd like to use it for the more natural eye days. 4. Elizabeth Mott You're So Fine liner - I'm meh about this liner. Again, I want to use it up. It flakes quite a bit though. 5. Manna K Sheer Glo - this doesn't make much of a different on my face, but I've been trying out with foundation when I decide to wear it. 6. Smashbox Eye Primer - I don't really use primers, but I've had this sample for awhile, and I've been using it. We'll see how much of a difference it makes when I try out my Naked 2 palette. 7. Benefit Cosmetics - Boi-ing Concealer - this is pretty much my holy grail concealer. I've hit pan, but it will probably take a few months to get through it. 8. ELF Correcting Powder - this stuff works! But I've had it forever and want to use it up. 9. Mac (some kind of loose powder) - I'm not a huge fan of this shade, or product. But it's mac, and was somewhat pricey, so I want to use it up. 10. Stila Illuminating Liquid Foundation in 10 Watt - this foundation was kinda expensive for me when I originally bought it. It says it is is light to medium coverage, but I only get light coverage out of it. It's very watery as well. Not the best I've used, but I want to finish it.